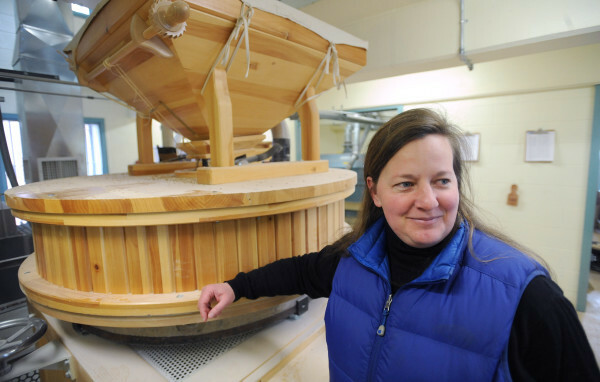 Amber Lambke, president of Maine Grains grist mill, is shown with the Austrian-made stone mill used to mill grains at the Skowhegan facility. Thanks to the efforts of a dedicated group of grain zealots, wheat from imported Estonian seeds is now sprouting in test plots across the state, part of a two-year trial to find what varieties of grains can grow well in Maine. The hard winter wheat called sirvinta seems to thrive here. Soon you may see even see bakers offering loaves of this nutty grain. “Last year we harvested and replanted 150 pounds and this year we harvested almost 900 pounds,” said Amber Lambke, executive director of Maine Grain Alliance and owner of Maine Grains in Skowhegan. Under the auspices of the Alliance’s Heritage Seed Restoration Project, “the idea is to get grains growing and make them adaptable to New England,” said Alliance board member Richard Roberts, who also experiments with Einkorn, Black Emmer and Danish “Midsommer” rye, among others. The Alliance has propagated sirvinta on small plots in Solon, Lincolnville and Parkman and now holds the largest volume of this rare, heritage seed in North America. Results of the two-year “Sirvinta in the Seed Project” will be released to Alliance members this month. The trials, from millers to bakers, were roundly successful. Soon they might get that wish. The Alliance hopes to have sirvinta seeds certified by the state and sell them to farmers by this fall. Originally brought to Maine in 1998 by an intern working with Franklin County’s “seed saver” Will Bonsall, the wheat is not yet widespread here, but it could become an important link in Maine’s recharged locavore movement.